What we did at Curating NoThing. On Notions of Dematerialization in the Exhibition Context. Dora García interrogates Nora Joung and Victoria Durnak with El helicóptero by Masotta on the background. Conference Sept 15: Curating NoThing. On Notions of Dematerialization in the Exhibition Context. Place: The Royal Institute of Art, Flaggmansvägen 1, Skeppsholmen, Stockholm. Dematerialization of art is connected to politization of art, as a resistance to the market, a reaction to the political landscape, a re- foundation of the role of the artist in society. How much of that has succeeded and how much of that has failed? Do you consider that process as concluded or do you consider we are still immersed in that process? Would you divide artists in “socially and politically aware” and “not socially and politically aware”? Do you consider a contradiction that socially and politically aware art is shown in galleries and art fairs? Should socially and politically aware art be more efficient inside or outside the art institution? Do you consider outside or inside the art institution the only two possibilities to show art? Is art effective as a tool to modify society or politics? What would you rather choose: institutional critique or art activism? What makes “good” institutional critique? What makes “good” art activism? How do you, as an artist, make a living? Is this satisfying for you? “Sluggish masses of matter are replaced by liberated energy.” said —El Lissitzky, in “The Future of the Book”, at the time of the Russian Revolution. It seems that dematerialization has to do not only with politization, but mainly with the access of a large audience (“the people”) to what before was the privilege of a few. As if it was desirable that art was no more private property, but a common. Would you agree with this view? How do you imagine your audience, who are they? Do you have them in mind when you work (this is, they are pre-existing to your work), or do you think your work creates them (this is, they are post existing to your work? Oscar Masotta, whom you know well, said that the material of dematerialized art was information. That was 1967. We live in a society where information is a commodity and a weapon. How do you view the statement of Masotta now? Do you think art is resistance, and if so, resistance to what? You are both artists and should be familiar with social media. Do you think the digital revolution has meant a big change in the practice and the reception of contemporary art? Can art be a threat to (established) power? Is the ability to threaten power a quality for art? Do you think artists are in danger in totalitarian regimes? more or less than any other profession or class of citizens? Can art collaborate with (established) power? Is the collaboration with power compatible with artistic quality? What do you think of Putin’s assertion that hackers are comparable to artists, and that they “can be patriotic”? Is “dematerialization” a general trend in culture (digitalization), in politics (network instead of party), in economics (neo liberalism), and dematerialization in art just a part of this trend? 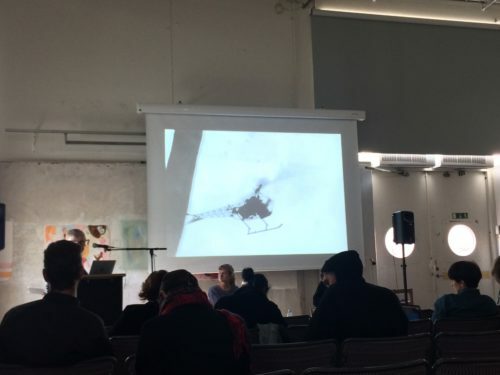 Kaprow spoke of “art” as “one of the many possibilities of a situation” – Do you think an art situation (with or without object) can make sense in other contexts, such as politics, or in other circuits, can art be several things at the same time? Bernie Sanders has just published a book, “The Bernie Sanders Guide to Political Revolution”. He is a politician that belonged to the classic civil rights era (70s) but has managed to interest very young citizens in politics. Do you think revolution is possible? Do you think revolution is necessary? Franco Basaglia defined subculture as “the culture of the deviant”. Some people maintain that subculture is not possible anymore because of the excess of information, that makes impossible for things to be “sub” this is, hidden from public view. Yet, deviancy is more alive than ever, since the latest politic trends (read alt-right for instance, Trumpism, or neoliberalism) are more than ever based on exclusion and privatisation. So being a deviant has never been easier- nowadays in the US being non-white, non-male, non-heterosexual, non-Christian, is already a way of being excluded. In this very complex landscape, What do you think is the relation between contemporary art and subculture – or deviancy? What does dematerialization have to do with authorship? Are you familiar with the artistic and political event known as Tucumán Arde? If so, in which you think it might be relevant to contemporary discourse? Dematerialization seems to be related as well to the notion of ecology, as Douglas Huebler put it. Has this ecological notion played any role in your work? Do you think this is something artists born in the 90s consider? The dematerialization of the art object has yet another consequence: the dissolution of artistic disciplines, which are, traditionally, organized around the idea of material. The dematerialized objects trade with information, and appear to be epistemological tools, made to understand something. Something like what? like a set of relations that constitutes: the world. The dematerialized objects of art could be understood as behavioural objects, circumscribing a set of actions addressed to the analysis of a certain fragment of reality. Would you agree that there is a clear relation between what is called now performance, and dematerialization? Would you comment briefly this passage?